The main objective of this report is to analysis the marketing plan and strategies for credit card pursued by the Mercantile Bank Limited in Bangladesh. Other objectives are evaluate the marketing strategies of MBL for credit card in Bangladesh and overall marketing policies. Finally provide recommendations regarding marketing plan to overcome the difficulties and provide Strength, weakness of Marketing Plan of Mercantile Bank. Mercantile Bank Limited is a scheduled Bank under private sector established under the ambit of bank Company Act, 1991 and incorporated as a Public Limited Company under Companies Act, 1994 on March 12, 1995. The Bank started commercial banking operations effective from June 02, 1999. During this short span of time the Bank had been successful to position itself as a progressive and dynamic financial institution in the country. The Bank had been widely acclaimed by the business community, from small entrepreneur to large traders and industrial conglomerates, including the top rated corporate borrowers for forward-looking business outlook and innovative financing solutions. MBL by concentrating on the activities in its area of specialization has achieved a good market reputation with efficient customer service and is one of the top most Bank of Bangladesh with good customer base and is achieving a growth of almost 50% per year. The Authorized Capital of the Bank is Tk. 3000 million and the Paid -up Capital is Tk. 1199.12 million although the paid up capital including the retained earnings is almost triple now. It has been growing faster as one of the leaders of the new generation banks in the private sector in respect of business and profitability as it is evident from the financial statements for the last 4 years. It has thirty-five branches to boast for all over the country. The Bank provides a broad range of financial services to its customers and corporate clients. The emergence of Mercantile Bank was at the juncture of liberalization of Global economic activities. The experience of the prosperous economies of the Asian countries and in particular of South Asia has been the driving force and the strategic operational policy options of the Bank. Mercantile Bank limited has been consolidating its position and preparing itself for the era by upgrading technology, training its workforce, restructuring organizationally and creating a new work culture. The Company Philosophy – “Efficiency is our strength” has been preciously the essence of the legend of bank’s success. The card facility was first introduced in the United States in the beginning of the 20th century. Western Union, a US money transfer company, started issuing an embossed metal plate to its preferred customers in 1914. The cardholder had to pay an annual subscription to join the club. This was the beginning of the charge card. On the other hand, in 1967 four California banks changed their name from the California Bankcard Association to Western State Bankcard association (WSBA). WSBA opened its license to other financial institutions. Its bankcard product was known as Master Charge. Numerous financial institutions became Master Charge members to compete with Bank America card. In 1977 Bank America card was renamed as Visa USA/Visa International and in 1979 master Charge changed its name to Master Card maintaining the lofty standard to meet up the customers’ expanded needs. A plastic card bearing an account number assigned to a cardholder with a credit limit that can be used to purchase goods and services and to obtain cash disbursements on credit. A cardholder is subsequently billed by an issuer for repayment of the credit extended at once or on an installment basis (minimum amount). Among the credit card brands, two of them are much reputed and covers about 90% of the world business. These are MasterCard credit card and VISA credit card. U-commerce envisions a world in which buyers and sellers can conduct commerce securely and conveniently, anywhere, anytime, anyway they like. In the real world and online as virtual marketplace, people around the world will enjoy new levels of convenience, safety and flexibility. Plastic card issued by a financial institution or other organization to their customers for the purpose of accessing credit or deposit accounts through ATM or POS terminals, or for the purchase of goods or services from the issuing organization. These cards are considered proprietary if they are issued under the Logo or emblem of the issuing organization instead of a logo such as VISA. An account, the customer can repeatedly use to pay back without having to reapply each time credit is used. The. cardholder is solicited, screened and approved by the issuer, which establishes a line of credit for the customers and issues the credit card. The cardholder uses the credit card either to purchase goods and services from a merchant or to obtain advance from a member of ATM for which the cardholder receives a monthly bill from the issuer. Receives and pays for transactions from MasterCard and /or VISA card. Bills and collects from the cardholder. The acquiring member or acquirer solicits, screens, and accepts merchants into its Credit Card program. The acquirer usually charges the merchant a merchant discount for handling the transactions. The acquirer is licensed by MasterCard or VISA and agrees to follow the operating rules and regulation of the two associates. MasterCard and VISA provide various services to the acquirer, including authorization and settlement processing, interchange and resolve member disputes. Many financial institutions are both acquirer and issuer. As acquirers they maintain the merchant relationship. As issuer they maintain the cardholder relationship. The merchant can be any virtually any company, which meets the qualification standards of MasterCard and/or VISA an acquirer. Typical merchant business includes retail stores, restaurants, airlines, mail order companies, and health plans to name a few. MasterCard and VISA both require that the merchant be financially responsible and of good repute. The merchant has a written agreement with the acquirer to accept the credit card as payment and to abide by the terms of the agreement. The judgmental method is the oldest form of determining credit worthiness. Under this method, a Bank loan officer or a credit analyst reviews every application. In essence, the loan officer uses the profiles discussed earlier to arrive at a decision. On the basis of training and personal experience, the loan attempts to predict the likelihood that the application will be good or bad credit customer. The first step in developing the credit score system is to define good and bad accounts because precise definitions vary from Bank to Bank. For example, a good account might be defined as one that will not exceed a 60 day delinquency and will not be past due more than twice during any 12 month period. A bad account might be defined as one that will become 90 days or more delinquent and may have to be charged off as a loan loss. Bad accounts that are in the advanced stages of delinquency or are already charged off. Samplings may also be taken from recent applications that were both approved and declined. These samples help validate the profiles that are being created from current or charged off accounts. A credit card is a great financial tool. It can be more convenient to use and carry than cash, and they offer valuable consumer protections. Paper money and coin are risky and burdensome for carrying. One can avoid the toll of finger-counting changes in this system. Dollars, Pounds or Taka can be plundered, lost or stolen. But there is no such fear for card. The cardholder is given a code number called PIN (Personal Identification Number) without which the card cannot be used at sales or services points where the PIN is required. Only the owner of the card will be entitled to use it. In case the card is stolen or lost the clients’ bank will issue a fresh card. The banking scenario has been undergoing an increased competition as a consequence of economic liberalization and globalization. So, bankers now have been compelled to constantly introduce new products to attract customers. The valued clients of the bank are increasingly demanding credit card in the product line-up. With a view to satisfying the clients’ needs as or market demands MBL had contacted a number of international Credit Card Associations such as VISA, Master card and American Express. It has been performing conventional commercial banking activity and striving to introduce Islamic Banking functions. It is the pioneer in introducing and launching different customer friendly deposit schemes to tap the savings of the people for canalizing the same to the productive sectors of the economy. For uplifting the standard of living of the limited income group of the population the Bank has introduced Consumer Credit Schemes by providing financial assistance in the form of loan to the consumers for procuring household durables, which have had encouraging responses. The operations of the Bank are fully computerized so as to ensure quick, prompt flawless and services to the customers. The Bank has introduced camera monitor system (CCTV) to strengthen the security services inside the Bank premises. SWOT analysis is a basic straightforward model that provides direction and serves as a basis for the development of marketing plans. It is the detailed study of an organization’s exposure and potential in perspective of its strength, weakness, opportunity and threat. This facilitates the organization to make their existing line of performance and also foresee the future to improve their performance in comparison to their competitors. As though this tool, an organization can also study its current position, it can also be considered as an important tool for making changes in the strategic management of the organization. A new bank product creates an appeal to the customers as well as the prospective clients if the bank has a good customer base and reputation in the market and this is the main strength of Mercantile Bank Limited. The bank has thirty five branches located in the key areas which may work as unique selling points to pursue customers to consume MBL’s product. MBL has a vast line of services, which cad attract people of different segment of the society. MBL currently don’t have any strong marketing activities through mass media e.g. Television. TV ads play a vital role in awareness building. MBL has no such TV ad campaign. The focal opportunity of the bank should be its competitors’ vulnerabilities. To propagate the line of customers the bank will have to introduce tempting features embedded with the product. Major contract with big corporate houses as well as middle class people might be a good market to exploit. The main threat for MBL is a wide range of competitors. About ten of them are multinational. The multinational banks came to our country with vast resources, like financial and marketing skill. Also new invented business tools and techniques are channeled to them from their parent organization. So, it is a threat for the MBL. The main objective of this research is to uncover the marketing strategies for credit card pursued by the MBL (Mercantile Bank Limited) in Bangladesh. In order to achieve this objective, the following issues have been considered. 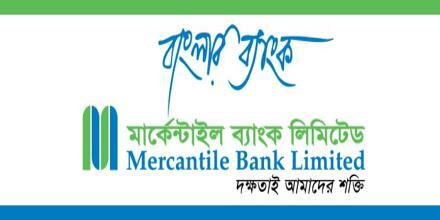 To evaluate the marketing strategies of MBL for credit card in Bangladesh. To provide recommendations regarding marketing strategies to overcome the difficulties. It is one kind of qualitative research, where the data collected are qualitative in nature. And the analysis of these data will be done qualitatively. The study combined of both primary & secondary data. The secondary data have been collected from published literature, journals, brochures, company information etc. The primary data have been collected through a series of semi-structured interview with senior managers & field observation of MBL in Dhaka, Bangladesh. Time period of the study lies between 15th Jan to 15th April 2007. The market plan is the central instrument for directing and coordinating a marketing effort. The Mercantile Bank limited is planning to launch the Credit Cards of MBL as an additional product for customer satisfaction and for a long-term relationship with customer with an objective to achieve breakeven within three years of its operation that is after launch (in 2006) within 2008. Considering the existing client base of 20,000 account holders it can be assumed this will not be a very difficult task to achieve. MBL is opting both for Silver and Gold cards. Any Bangladeshi citizens Except minor, insane, illiterate, lunacies, dependants, students, insolvent, bankrupt persons, loan defaulters, will be eligible for MBL VISA card. Employees, Executives and the Directors of Banks, Insurance and other types of Financial Institutions. Directors and Executives of Export oriented Garment industries. Members of renowned club and societies. Employees of Foreign and multinational Companies. Directors of 100% Export Oriented Leather and other Industries. Employees of Mobile telephone service Providers ie. Grameen phones, Bangla Link, Aktel etc. Renowned Businesspersons in the society. Members of Chamber of Commerce and Industries. High officials of renowned NGOs, International Voluntary organizations. First priority must be the existing valued account holders of the Bank. Employees of the reputed organization who are getting at least Tk.10, 000 salary per month. Employees of Bank & other Financial Institutions. Corporate clients of Mercantile Bank Ltd.
After studying the Credit Card market it has been seen that the Master Card brand name has already been exploited in the market by other banks and at present only Standard Charted Bank and more recently, Premier bank Ltd. Issue VISA cards, VISA card has a potential market. This helped by the fact the Standard Charted and the former ANZ Grindlays Bank operation in Dhaka had set up, Point of sale (POS) terminals side by side with its Master Card POS’s which can be used by the other banks’ VISA Cardholders. This will help us to launch the Card product quickly as the bank will not be required to set up POS terminal at merchant outlets. This part of Credit Card business is called acquiring and requires considerable amount of capital outlay, time and effort. The bank has also applied to VISA to do acquiring business. On the other hand, American Express POS terminals are in the market and if it wishes to launch the American Express brand Credit card we must acquire/ sign up good number of merchants first. Visa Classic Card for Local use. It may be mentioned that separate cards need not be issued if a cardholder wants to take a card both for International spending and local spending. This will be a special feature of MBL Visa card. The credit card market has matured since its inception in early 90’s. Cardholders are now more conscious about the benefits being offered by different card issuing banks. At present cardholders choose to select card fee and card limit as criteria for selection of card. It is needed to give a competitive edge to MBL Visa Credit Card over other Banks’ Cards in terms of card limit. But the delinquency rate experienced by the card industry of Bangladesh in past years is not a happy picture. The valued clients are increasingly demanding Credit Card in the product line up. Some of the competitors like prime Bank limited and National bank limited have already established themselves in the market in this regard apart from the major players like Standard Chartered Bank and the former Grindlays Bank. Information derived from either internal or external sources has helped to evaluate what needs to be done and to model its own process. Different banks that are operating credit cards have been traced for situation analysis. The bank has Visa Silver, MasterCard Silver and MasterCard Gold card. MasterCard Gold is targeted to high-end customer base that have a higher income. Silver cards have lower credit limits. The minimum income requirement for Silver is Tk. 10,000 per month and for Gold is Tk. 55,000 per month. The income of the applicant along with other financial data is the preliminary consideration in deciding the limit of credit. Standard Chartered Grindlays Bank offers air travel accidental insurance to its cardholders and this is maximum of Tk. 1,00,000 for Silver and a maximum of Tk. 5,00,000 for Gold. The bank has ATM machines in Dhaka, Chittagong and khulna. Several more new machines will be installed in phases. Standard Chartered Grindlays Bank has initiated for the cardholders’ benefit that a cardholder can withdraw maximum 50% of his card’s limit in cash on 30% interest. Earlier a cardholder could withdraw only 20% of his card limit on the same interest. National Bank burst into the world of credit card in October 1997. Like Prime Bank it has Gold International and Gold Local and Silver International and Silver Local. For Silver Card one must have a income of minimum Tk. 12,000 and for Gold Card a person must have an earning of Tk. 50,000 per month. But in some cases it is relaxed, for example, a high-ranking government official may achieve a Gold Card though he does not fulfill the condition of income. It is now dealing with more than 6,000 clients. Kazi Mainuddin Ahmed, Senior Officer, has supported the credit card adding that it’s something that can enhance the holder’s social status like the possession of a magnificent house, a car and a position give a person identity and standing in society. In response to question about decreasing the existing condition of income to be a cardholder Md. Hafizur Rahman, officer, has said ‘the cards are for a section of people, not for the commoners’. However, the issuance of credit cards is on the rise. Prime Bank opened its business of credit card in November 1999. The bank has Gold International and Gold Local, and Silver International and Silver Local. For a Silver Card one must have income range over Taka 10,000 and for a Gold Card a person is to have earning minimum Taka 55,000. Prime Bank inserts the client’s photograph on the credit card. When a cardholder receives his monthly statement, he can either choose to pay in full or just the minimum due amount shown on the statement. No interest is charged if he pays in full within the payment due date. There are many sorts of service charges like – annual fee, additional fee, replacement fee, late payment fee, excess limit penalty, return cheque fee etc. If a cardholder accumulates 20,000 Prime Bank Bonus Points for his Gold Card or 10,000 Bonus Points for his Silver Card in a year then he will enjoy card facilities without fee ($1 purchase equivalent to 1 Bonus Point). If a cardholder accumulates 10,000 Prime Bank Bonus points for Gold Card or 8,000 Bonus Points for Silver Card in a year then he will enjoy Card facilities without fee. (Tk. 50- purchase equivalent to 1 Bonus point). The highest Prime Bank Bonus Point Holder can enjoy free air ticket of Dhaka-Bangkok-Dhaka (Business Class). The bank has already listed about 3,500 members for their cards. An official of the bank preferring anonymity said introduction of any good thing like credit card is better but its practical use in our market places invites a lot of trouble because of malpractices. VANIK (now named as LankaBangla), a Sri Lanka-Bangladesh joint venture financial institution, has been rendering credit card services in Bangladesh since 1998. It has already crossed the mark of issuing 6,000 credit cards within a couple of years. Now it is covering only Dhaka city and it has a plan to spread its services to different parts of Bangladesh. VANIK issues two-type of credit cards – Gold and Classic. The minimum income requirement for Classic is Tk. 10,000 per month and for Gold is 50,000. For the Gold Card Taka 3,000 is to be paid as annual fee while Taka 1,500 for the Classic. Interest per month is 2.5% on carried forward amount for both the cards. Depending on the requirement of a client, one could either settle his outstanding balance in full by the date given in his statement or has the flexibility of paying only 1/12th of the outstanding balance in installment. Whatever method he chooses he can enjoy an interest free credit period of maximum 45 days. The validity of both cards is one year from the date of issuance. Ishtiaque Ahmed, working with VANIK in credit card evaluation division has said, many a time some subscribers seem to be reluctant to pay the bill and so they give the wrong addresses of their residences and offices and when the time for payment comes they could not be traced. To handle the problems, a team has been constituted to check the applicants’ addresses and other information whether these are true or false. Asked about the prospect of credit card in a poor country like Bangladesh, he responded positively adding that when an attempt was first made to market mineral water and tissue paper it was apprehended that they would not get good results, but the reality is quite opposite. The Grameen Bank is set to introduce its own version of credit cards for rural people. The Bank has taken up initiatives to bring the country’s rural masses, initially its members, under its IT network to facilitate their daily transactions and other business activities smoothly and bring about a qualitative change in their lifestyle through its ‘smart card’ project. The ‘smart card’ will provide facilities like banking, utility and insurance to members of the Bank’s micro-credit program. At the initial stage, a point of sale (POS) terminal device will be installed at various sites across the country, where Grameen members live. The users will be able to use ‘smart card’ to facilitate their business and other needs what usually the credit card users enjoy in cities. Grameen Software Limited (GSL) signed a memorandum of understanding (MoU) with Information Technology Consultants Ltd. (ITC) on May 5,2001 to implement the project. At every POS terminal, there will be a smart card that will preserve data of all off-line transactions. The card is expected to be introduced this year in greater Dhaka zone of Grameen network. Later, different villages across the country will be brought under the network of the smart card services. Such marketing Intelligence has provided information that is helpful to further modulate MBL’s own Credit Card design and enhance it better for consumers. To convince its existing Account holders also to influence external clients to operate with it. Guided by the marketing Objective and marketing Intelligence, the next step is to identify and evaluate market opportunities. A marketing opportunity has been basically identified by the customer complaints as well as suggestions. Considering its existing client base the demand for the credit card is enough to encourage its progress. It is a joint venture between Comex Genesys (a Singaporean registered company) and successful Bangladeshi Entrepreneurs. The company is incorporated and operating in Bangladesh as a third party processor of electronic payments, including full credit and debit card management system. Comex Genesys (“CGS”) is a wholly owned subsidiary of Commerce Exchange PTE LTD (“comex”), a Singapore-based company founded in 1999. The major shareholders of Comex include Visa International, Infocomm Investments, Citicrop N.A., Venture TDF Barings Private equity Partners, JAFCO investment (Asia Pacific), and JAIC Asia Capital. CGS is a leading cards and payment solution provided based in Kuala Lumpur, Malaysia CGS Offers a complete suit of card processing solutions including consumers, debit, private label and commercial cards and also other innovative cash management solutions to streamline and automate the cash payment and collection processes. CGS’s solution are fully compliant with all major payment associations including VISA , Master Card, Diners club and American Express . Developed on an open platform, CGS solutions are easily interoperable with all major existing consumer and corporate banking system. CGS currently has an active user base of 100 financial institutions in 31 countries for its software products. Maintains 24 hours global staff Credit Card software. Provide training to Bank staff on Credit Card software. Provide training to merchant on point of sale terminals. Ensure compliance to card association requirements. Provide appropriate disaster recovery and backup systems. Provide linkage to card association gateways. Provide data center and infrastructure according to international requirements. The Cardpro V5 EMV software used by BEPS has all modules conceivable to rum card operations. All other Banks in Bangladesh having card infrastructure including Standard Chartered do not have all the modules as it is expensive. Mr Andy Ng has been appointed by VISA to set up infrastructural facilities to provide link to VISA international data center from Bangladesh. Six more Banks from Bangladesh will start issuing cards onwards. If everything goes according to plan Mercantile Bank will be joining that group. The Cardpro V5 EMV software developed by Comex Genesys (CGS) and used by BEPS is a state of the art, well proven solution, rich in features and functionalities. Cardpro V3 , an older version of Cardpro V5 EMV is being used in National Bank Limited , Prime Bank Limited and VANIK Bangladesh limited. Cardpro is fully compliant to card association. International, regional and country specific compliances developed on an platform it can accommodate all credit cards including VISA, Master Card and AMEX cards as well as all debit cards and proprietary cards. This means that in return for the joining fee to BEPS SEBL can launch as many debit or credit card products it wishes to, even its own proprietary debit and credit Cards. It has been seen that the use of the services of BEPS, a third party processor is the best option for us. Installing of its own infrastructure is a viable option when it will reach threshold of nearly 40,000 Credit cards. The cost for principal membership of Visa will come to around Tk. 52,32,000.00 and cost of membership of BEPS will be Tk. 36,00,000.00. In addition an amount of Tk.6, 55, 000 will be required for the necessary hardware at the Card center at Head Office. Therefore MBL requires an investment of Tk. 94,87,000.00 to introduce VISA Credit Card product in the Bank. At the beginning 12 people will be required at the card center but when card activity will start it will require about 20 persons. At least 2 of those people should be technical experts (good Knowledge of computer hardware, credit card software and communications) and six marketing persons and the rest will be for card center management/ accounts management. It may be mentioned that separate cards need not be issued if a cardholder wants to take card both for International and Local Single plastic will be used for dual, local and International spending. This will be a special feature of MBL Visa Card. * Upper limit of USD portion depends on the available balance in RFCD A/C and Retention Quota Foreign Currency Account as per Guidelines for Foreign Exchange Transactions and Bangladesh Bank Circular issued from time to time. Upper limit of Taka portion depends on security coverage and credit matrix. Also Bangladesh Bank (the regulatory body of banks) Prudential Guidelines for Consumer Financing will be followed in this regard. MBL Visa Credit Card holders can withdraw cash from ATM or Bank Counter. Cash withdrawal limit for MBL Visa Credit Card is 50% of Card Limit. The most preferred way of issuing credit card is against security. Security may be in the form of Lien on FDR, SB and CD A/C, Personal Undertaking, Corporate Undertaking, Letter of Comfort. Since the existing market is very competitive, it may have to bargain with the customers for obtaining minimum security. If not possible to retain minimum security it may follow the credit matrix (given below) to fix the card limit. However, card matrix will only be applicable for local card issuance, for International Card Issuance we will follow Bangladesh Bank Foreign Exchange Regulations where each card will be issued against security. Any Bangladeshi Citizen except minor, insane, illiterate, lunatics, dependants, students, insolvent, bankrupt persons, loan defaulters will be eligible for MBL Visa Card. In any case of deviation proper approval from Bangladesh Bank along with adequate security is required. International Card limit against Travel Quota will have the card limit as per yearly Personal Travel Quota of Bangladesh Bank. As per Bangladesh Bank Guidelines for Foreign Exchange Transactions, a Bangladeshi National can spend USD1000/= when traveling in SAARC Countries and Myanmar by air during a calendar year, within this annual limit, up to USD 500 can be spent for overland travels to the aforesaid countries. For traveling in Non- SAARC countries a Bangladeshi National can spend maximum up to USD 3000/= from the cardholder will be taken before card issuance for above compliance. Moreover, software customization for the delineation of the quota for SAARC Countries and Non-SAARC Countries to be strictly followed for security purpose of the Bank Lien on FDR will be as security before sanctioning Int’l Card Limit for Travel Quota Card. As per Bangladesh Bank guidelines for Foreign Exchange Transactions, a Bangladeshi National can bring in up to USD 5000 while returning from abroad without declaration to Customs Authority in FMJ Form. The person ordinarily resident in Bangladesh can open RFCD A/C where foreign exchange brought in at the time of his/her return can be deposited. International Card will be issued against the balance available in RFCD A/C. As per Bangladesh Bank Guidelines for Foreign Exchange Transactions, exporters may retain7.5 % of repatriated FOB value of total exports as retention quota. International Card will be issued to maximum of 3 executives (as defined by Bangladesh Bank) against Exporters Retention Quota. In credit card business there are two sides: Issuing and acquiring. Issuing business refers to those activities that relate to the issuing of Credit Cards like issuance fee, Card replacement fee, PIN re-issuance fee etc, and also interest income. Acquiring business refers to those business activities, which relate to hiring of merchants and setting up of Point of sale terminals at merchant outlets and collection of merchant commission of usage basis from the other banks clients. Silver card: Tk. 750.00 less Tk.400.00 (charges payable to BEPS is Tk.250.00 per card. Gold card: Tk.1000.00 less Tk.400.00 (charges payable to BEPS is Tk.600.00 per card. Bank will collect interest income from outstanding amount from Credit Card holder account after allowing a grace period of up to 45 days at 2.5% per month chargeable monthly. Other than the above there are other avenues of income such as: Card replacement charge, Later payment charge, excess over limit charge and PIN re- issuance charge. Pricing has been in comparison to the other players of the market. In banking arena Mercantile Bank Limited is mainly competing with the second generation banks which includes Prime Bank Limited, Dhaka Bank Limited and the upcoming Premier Bank Limited. The pricing has been done in such way such that MBL’s products are cheaper than Prime Bank Limited so that it could persuade some of the clients of Prime Bank Limited and Dhaka Bank Limited, it can also hope to compete with The City Bank Limited in terms of the service that it provides. Below outlined a formulated three year business plan and based on which a financial analysis has been prepared. All the existing branches of the bank shall issue the cards. The general guideline shall be given to the Dhaka based branches for issuance of the cards as per the already set card limits, concentrating on the target market and by using the credit matrix. As already mentioned the fact that the Standard Chartered and the former ANZ Grindlays Bank operating in Dhaka had set up Point of Sale (POS) terminals side by side with MasterCard POSs which can be used by other banks’ VISA card holders . This will help to launch the product quickly as it will not be required to set up POS terminal at merchant outlets. The product may be launched by the 2nd June, 2006 on the 7th Anniversary of the bank. In case of promotion, personal selling will be more effective than any other forms of promotion. The MBL should conduct workshop on its credit card product for the employees of our bank so that they are well equipped to promote and influence the existing base of client to go for its credit cards. In addition to this the Card representatives those who have been already recruited and specifically assigned to this job are constantly going to various people to increase the use of its cards. Mercantile Bank avoids vigorous advertising through media, as its target group is not the mass but the higher income group. But for this specific product it should be launching it through few advertisements in the daily newspapers at least twice before the launch so that people are reminded that something new is happening in the Bank. Public relations is a coordinated attempt to create a favorable product image in the mind of the public by supporting certain activities or programs, publishing commercially significant news in a widely circulated medium. The launch of the product is in concurrence to its decade of existence for this reason paid media coverage will be obtained and the product will be launched with a lot of enthusiasm. Obtaining Principal Membership of VISA. Licensing Agreement with VISA International has been completed and they have allowed issuing the four types of cards. Agreement with Bangladesh Electronic Payment Systems Limited (BEPS). Card Limits are already set. Target group of SEBL already identified and conveyed to its branches and to the representatives of the CARD department. Appraisal format done for selection of Cardholders. Hardware requirements fulfilled through local purchase from its suppliers. Organogram of the Credit Card Department is already done. Credit Card department should be organized. The design and plan of sitting should be done in such a way so as to attend clients at the head office level brought in by the field representatives. The front portion of the head Office should be redecorated to efficiently serve the clients with all modern furnishing and outlook. At least ten new personnel must have been recruited. The newly recruited should be very much experienced in the field. They can be brought in from the banks, which are already in service of credit card in the market such as Premier Bank Limited, Prime Bank limited. Besides that four or five officers from the existing base of employees required to be transferred to this department for efficient service of this department. To ensure that the system of payment works efficiently, the product must have been distributed to the employees at 50% fees during the beginning of this year (As it already did). Thus the products operational feasibility has been tested and the results show it can be successful in providing efficient service. The International cards have been tested by its sponsor directors and it has kept up to its promises. The ‘credit card’, though a new phenomenon in business and transaction arena which had already won the hearts of millions across the globe, has set its foot in this part of the world with its magical power and becoming a way of life here by offering its handy feature and usefulness. In the advent of Information Technology and globalisation, now shoppers need not worry about money, all they need is willingness and a credit card to buy anything they want at any places across the ‘Global Village’. Worldwide access, acceptability and popularity as well of credit cards have rose to such an extent that it is now posing a threat to theory of old ‘hard-cash’ possession of currencies amid growing sense of insecurity worldwide. The forward march of ‘plastic money’, the other name of the credit card, is so rapid that the whole concept of monetary system needs immediate review as it has put a question mark in the very existence of paper money. The pace of growth depends on the number of cards that are required in the market. In the past few months, there has been an acceleration of migration to the credit cards but more needs to be done to influence its use. At the end of June 2006, according to the latest Visa report, 64 million Credit cards had been issued (8.7% of total Visa cards in Bangladesh). In Bangladesh more than 60% of Visa cards are now used. According to reports, substantial work is continuing with the deployment of automated teller machines (ATMs) and point-of-sale terminals. About 900 terminals (20% of the total) have been deployed across Dhaka with more than 50 ATMs upgraded. All these figures will have increased by the end of 2005, indicating that Bangladesh is setting the pace in the global migration to chip and PIN (Personal identification Number). But, with card issuance just beginning, VISA Card represents an excellent example of visionary idea and cooperation that have changed our daily lives. Since its introduction more than 33 years ago, VISA has changed the way financial institutions, merchants and consumers transact business through its single efficient system of electronic payment and exchange. VISA has 57 percent of the world share of Credit Card business, making it the largest amongst all the competing Credit Cards put together. It has unsurpassed processing capability and last year it processed US$2 trillion of transactions on behalf of 22000 member banks. It has more than 1 billion cardholders and 20 million merchants locations. In Bangladesh Premier Bank has issued more than 14,000 Cards since launching of Credit Card in January this year. Card members include corporate executives, employees and students. Credit card service is provided by 23.1% of the banks including both PCBs and FCBs. Telebanking is second most penetrated e-baking service in Bangladesh. Credit card is becoming very popular service in major cities of Bangladesh; during 1999 the growth of credit card market is almost 100 percent. A marketing plan is the marketing logic where by the company hopes to achieve its marketing objectives. It consist of specific strategies for target market, positioning, and the marketing mix. Market means all actual and potential customers. And the target market means the process of evaluating each market segment’s attractiveness and selecting one or more to enter. In MBL a marketing opportunity has been basically identified by the customer complaints as well as suggestions. Considering its existing client base the demand for the credit card is enough to encourage its progress. Here they took help from marketing intelligence for assessing competitor and product aspect. Any Bangladeshi citizens Except minor, insane, illiterate, lunacies, dependants, students, insolvent, bankrupt persons, loan defaulters, will be eligible for MBL VISA card. After selecting he target market the MBL tended to precede for positioning the product. Positioning can be defined as occupying a distinctive place in the customer’s mind. Here the company prepared a message based on their objectives. MBL try to position their credit card by focusing on low price and using VISA that is the product of ANZ Grindlays bank, which is the introducer of ATM. The marketing mix can be defined as a set of controllable elements. Those elements are divided in to four parts. Those are product, price, place and distribution. A product is any goods , service or idea which is able to meet a customer’s specific need. Mercantile Bank Ltd will issue the following types of cards and the product is as such differentiated according to the usage and the limit for each kind of cards: Visa Gold Card for International Use (Also can be used locally), Visa Gold Card for Local Use, Visa Classic Card for International Use (Also can be used locally) and Visa Classic Card for Local Use. It may be mentioned that separate cards need not be issued if a cardholder wants to take card both for International and Local Single plastic will be used for dual, local and International spending. This will be a special feature of MBL Visa Card. Another phase of marketing mix is ‘Place’, that is, the channel of distribution. By this process the firm make product avail to the customers. Standard Chartered and the former ANZ Grindlays Bank operating in Dhaka had set up Point of Sale (POS) terminals side by side with MasterCard POSs which can be used by other banks’ VISA card holders . This will help to launch the product quickly as it will not be required to set up POS terminal at merchant outlets. Promotion is one of the most important tools of marketing mix. Promotion can be defined as the marketing process by which firm pursue its customer to buy its product. MBL use three types of promotional tools, those are advertising in newspaper, personal selling and maintaining public relation. What product might be offered, and what feature needs to be included in the future? Whether MBL should offer a VISA or MasterCard or both? Should both Gold or Standard card will be offered? SWOT analysis must be an effective tool to attend the above queries. A new bank product creates an appeal to the customers as well as the prospective clients if the bank has a good customer base and reputation in the market and this is the main strength of Mercantile Bank Limited. The bank has thirty five branches located in the key areas which may work as unique selling points to pursue customers to go for MBL’s credit card. Besides, for MBL Visa Card separate cards need not be issued if a cardholder wants to take card both for international and local spending which is a special feature of its product. Most importantly the bank already has a good IT base and a skilled management to uphold the product in the future. The major weakness of the product is that there are many business centers, which do not give card facilities causing troubles to the cardholders. Moreover, the most disadvantage of the card is that all the people wishing to be cardholders cannot enjoy card facilities because of ceiling-touch income bracket along with other criteria, only a certain section of people fulfilling criteria can be cardholders. The focal opportunity of the bank should be its competitors’ vulnerabilities. To propagate the line of customers the bank will have to introduce tempting features embedded with the product. Major contract with big corporate houses as well as middle class people might be a good market to exploit. After having a good customer base with Visa credit card the bank could start to operate Master Card simultaneously to grab the mass market. Notably, ever speedy lifestyle trend holds a good future for the product. The relatively low security of the credit card system presents a major threat for credit card market. There are a number of credit cardholders who do not give the money to the bank after finishing the card limit. In this case, the banks have to fall in troubles and expansion of credit cards is naturally discouraged. Again, there are some people who try to take illegal advantage over credit cards. A person was arrested on charge of possessing fake credit cards. In addition, substitute services and volatile economy may shrink the market demand of the product. the potential of the bank. Applying SWOT in this fashion can obtain leverage for the bank. As can be seen developing a sound marketing plan is the first critical milestones in establishing a bank credit card program to be effective. A marketing plan can be beneficial one if it is used to analyze objectively. However, at this stage, there will likely be many potential directions for the marketing department to pursue. But due to the limited resources that most companies have, it is difficult to accomplish everything at once. The marketing manager should prioritize all marketing activities and develop specific goals and objectives for the marketing plan. Banking is a service-oriented marketing. Its business profit depends on its service quality. That’s why the authority always should be aware about their quality of service. Visa is developing new payment products, and experimenting with wireless credit card facility that can connect with processing units, providing more information and transaction security; MBL may consider it as for an upgradation of the product. Propagate the line of customers by introducing tempting features like- Waiver of annual fee, Free Air ticket, Card Design etc. For the customers with poor or no credit history the bank may incorporate Secured Credit Card (a special type of credit card) available with both Visa and MasterCard logos on them. To avoid forgery the bank may go for Smart Card which are intended to make forgery more difficult. Bank should have a centralized fraud reporting and investigation agency for plastic cards, which will maintain close liaison with the police. To realize greater performance out of credit card program MBL may establish a member relationship with PSCU financial service, which is recognized as the leading credit union industry partner. The bank may offer a package of products to meet the needs of any small business. This suite of products includes Business Credit Cards, Merchant Processing and Business Debit Cards separately. Finally, one of the major business strategies is promotion. Successful business depends how they can promote their products or services to the customer. In this connection to improve the market status bank should introduce more promotional programs.